Last year I had a huge ‘a-ha’ moment about my business and my blog. One of those big ‘lightbulbs-flashing’ realizations. Basically I’ve been doing you a disservice. I’ve been apologizing for asking you to spend time in the kitchen (I did write a whole book of 10-minute recipes) instead of inspiring you to enjoy your time cooking. I still believe that delicious, healthy food need not be complicated nor take hours and hours. And I still believe in the power of keeping things simple. But from now on I promise to lead by example. And inspire you to enjoy one of (my) life’s biggest pleasures more often. So let’s get the year started in a positive way with the 5 biggest reasons I just love hanging out in my kitchen (with a baby playing on the floor). I love that cooking give me a chance to be creative and indulge in some ‘play’ time – something we adults could do with a lot more. I adore losing myself in the rituals of chopping, stirring and tasting. When you’re cooking you get to choose what you make AND what goes into each dish. You also get to choose the quality of the ingredients. So it’s easy to make things that are the most delicious to you. Love chilli (like I do)? Then add more. Love sharp, acidic flavours (like I do)? Then add a splash of vinegar or a squeeze of lemon. Think of it as a choose your own (tasty) adventure. 3. It’s good for your body. The more I learn about nutrition the more I’ve come to realize that the most important factor for healthy eating is to avoid processed food and focus on using real ingredients. And the best way to do this? Cook for yourself as much as you can. 4. It’s good for the soul. Spending 30 minutes in the kitchen preparing dinner will put me in a much calmer, less frazzled mood than sitting on the couch for the same amount of time. Plus it gives me an opportunity to nurture my family and friends. To express my love and take care of them. As much as I’d like to think that all these lofty benefits were what first got me into cooking, really, it was the praise. Hearing the words ‘this is amazing’ was a huge motivator for me to keep spending time in the kitchen when I was learning to cook. I only became a huge fan of peaches a few years ago when I started roasting them. It’s almost magical how a little spell in the oven transforms them into super sweet sunny globes of goodness. Now they’re one of my favourite Summer fruit. Roasting fruit like this is brilliant for enhancing the natural sweetness without having to rely on adding processed sugar. Fergal and Finbar just loves these peaches and will happily gobble up as many as I keep feeding them. But they make a super lovely dessert for adults too. The quantities are totally a guideline, you can double or halve the recipe depending on how much fruit you have. 1. Preheat your oven to 180C (350F). 2. 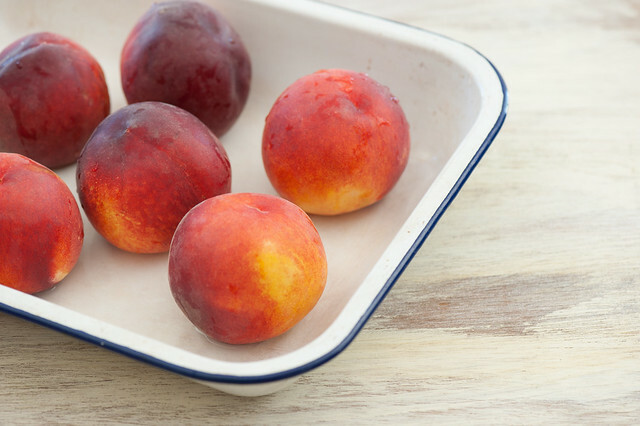 Rinse peaches and layer in a baking dish. Cover with foil and baked for 30 minutes. 3. Remove foil and return to the oven uncovered this time and bake for another 20-30 minutes or until the peaches are soft and squishy. 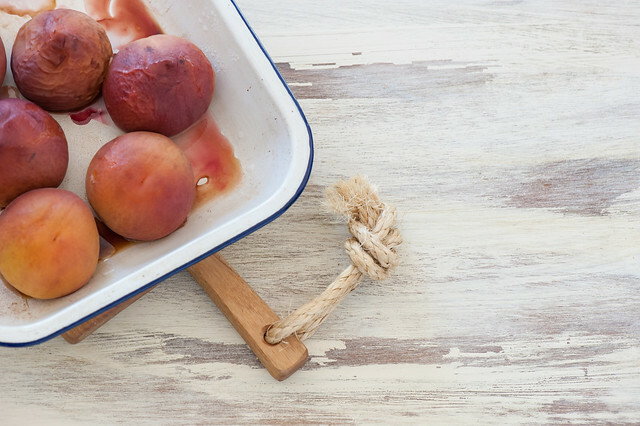 different fruit – my favourite way to cook all stone fruit (think apricots, nectarines, plums, cherries), apples and pears. I usually quarter apples and pears to remove the seeds. And sometimes I halve apricots or plums and remove the stone, if I can be bothered. I usually pit cherries first because I’m feeding them to little ones (who I must really love because it takes for-ev-er). Smaller fruit will take less time to cook. different flavourings – feel free to add a chopped vanilla bean or some lemon zest. more ‘saucey’ – leave peaches to cool with a foil cover on. short on time – serve fresh berries or peaches with ice cream or cream. paleo (gluten, grain + dairy-free) – serve peaches with coconut cream or coconut yoghurt. With love and best wishes for the new year! I very much enjoy cooking and do it well, but rarely hear strong compliments on my cooking – it’s just not in my husband’s nature to do that. I’m afraid that cooking leaves me feeling frenzied all too often, but every now and again I come across a recipe like the one I made for dinner tonight that do result in my feeling calm, because they come together so nicely. Love the idea of roasting peaches. Now, if only I had an oven at the house (at the beach) where I can get really good peaches… BTW, I have found you inspiring, because I’ve learned so much from you (especially simplifying and substituting ingredients). Yay for simplicity and kitchens Ruby! Couldn’t have said it better myself! I luurrrvve my kitchen time, daily at least, for exactly your reasons! This is what we call “FUN”. And rewarding fun at that, as you say! Great blog. I would like to add couple points on why i like to cook. The roast peaches look sooooo amazing! I will have to try them this weekend.